Competitive Nordic skiers are known as the fittest people on earth. This designation comes from scientific testing that demonstrates Nordic skiers have the highest VO2 max, which is the amount of oxygen the human body can take in and utilize per minute. Outside of genetics, the sport itself develops VO2 max through the requirements of movement and engagement of the whole body. Arms, legs and core are all essential, and when combined with proper technique, Nordic skiing can generate some incredible speed and performance gains. 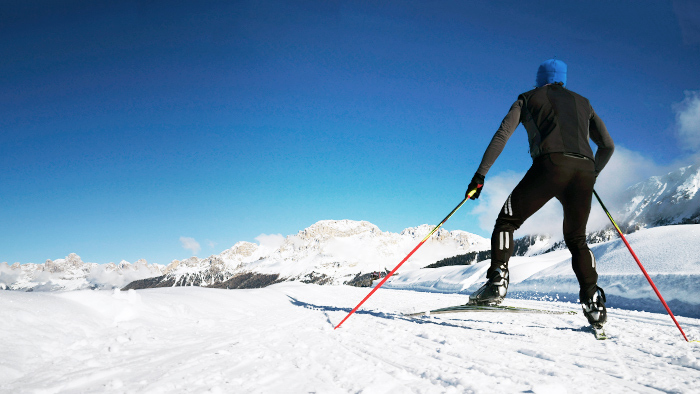 The off-season triathlete or cyclist can benefit from incorporating Nordic skiing into their winter training routine. Not only can it be a great break from the monotony of indoor training, but it also offers enormous cardiovascular and muscular benefits, as well as increased coordination and the chance to fire up some different muscle fibers. There are two basic types of Nordic skiing happening on groomed trails. The first has been around the longest and is referred to as diagonal or classical skiing. The skier keeps the feet parallel, and uses a “kick and glide” technique. The ski for this type of skiing has a kick zone or pocket that extends from the toe out behind the foot, the size depending on the skier and the flex of the ski. The base in that area is manufactured with a rough area of scales that can grip the snow, or is designated for kick wax applied by the athlete in accordance with the snow conditions on a given day. When the athlete puts weight on the ski, the pocket is pushed flat, the grippy surface grabs the snow and the skier is propelled forward. Poles for classic skiing are generally to the middle of the shoulder and the boot has more flex to allow for the bend at the toe when kicking. The second type, and perhaps the more popular for the cross training triathlete or cyclist, is skating. Skating became an official Nordic discipline in 1987 after professional athletes were already starting to incorporate it into their races because of the speed increase. Skate skis tend to be shorter with less camber or flex. The entire ski is waxed for speed as the motion of the foot is lateral and assists in generating forward propulsion. Much of the power for skating comes from the core and the upper body. Therefore, the poles are taller and the boot is stiffer and taller, so the effect is more like a speed skate with the ski representing the blade. The USSA Level 100 manual designates nine areas that are consistent between disciplines and can be considered when learning to ski. Keep an active forward body position, aimed down the trail. Weight should be distributed over the ball of the foot. Knees and ankles should be relaxed and supple. Keep a positive shin angle. Hips should be high and forward, yet neutral. The upper body maintains a soft “C” shape. Shoulders should be relaxed and rounded. Arms should stay relaxed and aimed in the direction of travel. Head should be aligned with the body instead of looking up. As a long time ski instructor and coach, I recommend a few things to get started. First, make sure you have the correct equipment for what you are trying to do! The number of times I’ve seen athletes trying to skate on heavy, scaled skis are too many to count. Visit your local shop or rent for your first few times. Once on snow, find a flat, open area to practice. Before ripping down the trail, you need to learn how to balance. Set the poles aside and simply start moving forward, shifting your weight fully, thinking about lining up your toe, knee and nose with your shoulders squared over the ski. This will help you exaggerate the motion needed to skate. Don’t add in the poles until you’ve mastered this weight shift. Be brave here. Falling over is part of the learning process. Take risks here and it will pay off later. Once ready for poles, make sure the straps are properly placed on the hands.The simplest way to start skating is with the V1, which involves polling on one side and gliding on the other. Power, glide, power, glide—continue to make a complete weight shift and refer to the list above. Here is a short video that is helpful. One of the most common questions I’ve fielded over the years is: How do you stop without edges? Simply put, your ski has an edge, it just isn’t the metal edge most alpine skiers are accustomed to. You are able to drive the inner edge of the ski into the snow on downhills for a snowplow stop. The key to Nordic skiing on the downhills: relax, keep the weight forward, knees slightly bent, arms and poles to the sides of the body with the tips behind you. Don’t try to use the poles to slow you down by sticking them into the snow in front of you—but it’s okay to drag them behind you. Technique is a big part of Nordic skiing. Be patient at the start, get the right equipment, relax, and take some risks, and soon you’ll be ready to sweat out some workouts in the fresh winter air. Part of the fun and benefit of skiing is that the uphill or flat work is balanced with the thrill of speed (and recovery) of going downhill. This allows for all kinds of training, from natural fartlek intervals, to hill repeats, to speed training and VO2max efforts. It can also allow for a long, steady, endurance effort on an undulating course for hours. Get inspired and get out there while you can!